For weeks, the man from the Seattle suburbs found himself getting emails from people he didn’t know about a bachelor party and a groom he’s never met. He saw names of Philadelphia landmarks like Reading Terminal Market thrown around in the emails but couldn’t put his finger on where they were located until he searched the names online. “I had no idea what any of these places are,” said DiJulio, 31, who’s never been to the Northeast. “After Googling them, everything was pointing to Philadelphia.” It turns out DiJulio, an information technology worker and a married father of one in Burien, Washington, had been mistaken for a friend of the groom with a similar last name. He sat as a “fly on the wall” for much of the email chain until Monday, when he broke the news after the groom’s brother wanted a headcount of people attending the party. But it didn’t end there. Groom Jeff Minetti, 34, figured: Why not still invite him? To me, the reason why not is obvious. You don't know this person. He could ruin your entire wedding. He's a stranger and you don't invite strangers to your wedding. But, that's the Cascadian talking, and we're not talking about a Cascadian who invited DiJulio to the wedding. In fact, the Cascadian DiJulio was the one who quietly watched as strangers talked around him. He didn't chime in, he just waited. This is the Cascadian Calm, the laid back, open and quiet regional personality that often gets described as the Seattle Freeze. And, this is almost the polar opposite of the regional personality that DiJulio was dropped right in the middle of. 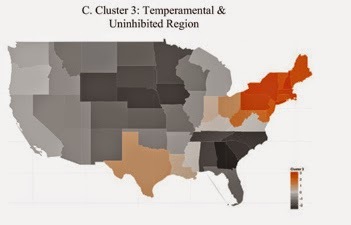 In fact, Philadelphia is dead center inside a regional personality that has been described as "temperamental and uninhibited." Here's another version of the same map, which shows the entire country in the same context. Uninhibited makes sense here. It made total sense to the groom to invite the interloping and eavesdropping stranger. Temperamental makes sense too. We usually think as temperamental as moody. As in "bad mood." But, in this case, it means almost unreasonably good mood. "Hey, you're a stranger that's just been listening in?? Yeah! You're invited too!" But, it also means for that DiJulio, in contrast to the Cascadian Calm (which is very not temperamental), that there's another side of the coin. People get angry man. Just saying.